We’d love your help. Let us know what’s wrong with this preview of The Heir by Elizabetta Holcomb. In order to get the man she had been obsessing about, Shelby Hollier has done unimaginable and unladylike things. Like stealing Solomon Tremaine’s wallet, stalking his home and trespassing upon his property. Before she knows it, she is sucked into a wormhole and into a world she never imagined still existed. Welcome to Dover Castle. A place where things are never what they In order to get the man she had been obsessing about, Shelby Hollier has done unimaginable and unladylike things. Like stealing Solomon Tremaine’s wallet, stalking his home and trespassing upon his property. Before she knows it, she is sucked into a wormhole and into a world she never imagined still existed. To ask other readers questions about The Heir, please sign up. In order to get the man she had been obsessing about, Shelby Hollier had done unimaginable and unladylike things. Like stealing Solomon Tremaine's wallet and stalking his home and trespassing his property. Before she knew it, she was sucked into a wormhole and into a world she never imagined still existed. In the 1300s. Solomon Tremaine was such a darling... (well, compared to his other siblings, that is). Shelby was a brave heroine, one who stood on her own and got a good head on her shoulders. In order to get the man she had been obsessing about, Shelby Hollier had done unimaginable and unladylike things. Like stealing Solomon Tremaine's wallet and stalking his home and trespassing his property. Before she knew it, she was sucked into a wormhole and into a world she never imagined still existed. In the 1300s. It was fascinating to see the modern world people collide with the honorable men and women of the past, to see brothers eating Twinkies and Oreos in the 13th century. Oh yes, this is not your typical time-traveling genre. There was more to The Heir than meets the eye. The characters were an interesting bunch of personalities, the languages they spoke of range from modern English, to Medieval England, to having a heavy Cockney accent. That alone pumped me up. Abigail, as per usual, was a delight among the family, Jeremy was still the most sensible among the brood, (in my opinion), and Jareth, the King who was always furious with his sons (well, sort of). Elizabetta Holcomb did an excellent job in keeping the reader interested until at the last page of the book. I might have been a little confused once or twice due to the time-travelling stuffs at the beginning, but eventually, I was able to catch up and stay entranced with the Tremaine's in the Dover's Castle. I would love to tell more about the story, but I don't want any more spoilers, because this is a book that must be devoured in order to fill a reader's hunger. Book 3 of the Chronicles of Dover's Amalgam is just what I need after a stressful holiday weekend. Word of advice to the royals, though: "Thou shall not twerk in Windsor Castle." LOL! Review of The Heir by Elizabetta Holcomb. Rating: 5/5 stars. No doubt. The plot: In order to get the man she had been obsessing about, Shelby Hollier has done unimaginable and unladylike things. Like stealing Solomon Tremaine’s wallet, stalking his home and trespassing upon his property. Before she knows it, she is sucked into a wormhole and into a world she never imagined still existed. Welcome to Dover Castle. A place where things are never what they seem.. The Heir is the third installment in Review of The Heir by Elizabetta Holcomb. The Heir is the third installment in the Chronicles of Dover's Amalgam and if I thought The Guardian and Category Jeremy were two of the best books I've read this year, I was wrong, because The Heir surpasses them. I seriously have no words to describe how perfect Solomon's story was. In my opinion, beside having the most beautiful cover of the series, The Heir also has the best plot. I loved Solomon, he reminded me a bit of Étienne from Anna and the French Kiss, not because of his story or anything, but just from a behavioral point of view. His modern time behavior of course, not the 14th century duke's behavior. That would've been odd. I loved how delicate he appeared to be, and how shy-but not too shy he seemed. Then there's Shelby. Now that I've read book 3 I can confirm that Shelby's my favourite female character of the series, followed by Beau and then Elizabet. She's more like me, not that I would pick some guy's pocket just to see him again, but still, she's a strong character and she definitely knows what she wants. The Tremaines are an amazing family and I love how the author build the relationship between all of them. What do I think? Let me tell you this...I read the book before going to sleep and never got that sleep. I read it in one sitting. I read it the whole evening. By the time I finish it, it was already dawn. I tried to stop reading but obviously that didn't happen. It was that good. The same thing has happened to me, if I remember it correctly, when I read The Guardian and Category Jeremy. Book 1 is about Elizabet and Jareth - the parents. Book 2 is about Beau and Jeremy - their oldest (adopted) son What do I think? Let me tell you this...I read the book before going to sleep and never got that sleep. I read it in one sitting. I read it the whole evening. By the time I finish it, it was already dawn. I tried to stop reading but obviously that didn't happen. It was that good. The same thing has happened to me, if I remember it correctly, when I read The Guardian and Category Jeremy. Book 1 is about Elizabet and Jareth - the parents. Book 2 is about Beau and Jeremy - their oldest (adopted) son. On this book, we are having a look on Solomon's life - their first natural-born son and also their legal heir. Although the major theme of the entire series is on how the Tremaines meet their spouses, Shelby and Solomon's story feels different to me. Maybe it's because Shelby was head over heels attracted with Solomon right from the beginning? She is different. I like her better than Beau. I think as the series progress and we meet more characters, there will really come a time that we will be able to pick our favorites. First, I want to thank Elizabetta for allowing me to read her wonderful series! I am going to start by saying that I loved, no obsessed over Category Jeremy. It is definitely without a doubt my favorite book so far in the series. I was intrigued by The Guardian and blown away by Category Jeremy, but The Heir was all together another story. It is one that I did enjoy, but I will not be rereading it anytime soon. What makes The Heir different is that it has a lot more action and time traveling than First, I want to thank Elizabetta for allowing me to read her wonderful series! I am going to start by saying that I loved, no obsessed over Category Jeremy. It is definitely without a doubt my favorite book so far in the series. I was intrigued by The Guardian and blown away by Category Jeremy, but The Heir was all together another story. It is one that I did enjoy, but I will not be rereading it anytime soon. What makes The Heir different is that it has a lot more action and time traveling than the previous novels. I was pleasantly surprised by the increased tension and fight scenes. We really get to see the story grow and evolve with this book. Seeing Jareth’s children grow into young adults and struggle with life had me feeling as if they were my own family. The chemistry between the characters and the family is what really tugged at my heart. It was clear just how strong of a bond they shared. While Solomon did frustrate me at times, Abagail caught my attention the most. It makes me so excited to know more about her story and future. The part that ruined it the beginning for me was the romance between Shelby and Solomon. Only about halfway through the book, did I accept their weird relationship. It is all personal, because I cannot stand when a girl crushes/fangirls to that extreme over some boy. She just came off as annoying to me, and it made it hard to get through the first half of the book. However, once she focused more on the ongoing storyline and not as much on the romance, I found myself liking and almost loving the book. The mystery of the stolen books and the riff it causes between family members makes for a wonderful tale. Sometimes romance enhances these types of novels, like it did for The Guardian, but for this book I felt like it held it back and did not let it grow to its full potential. Overall, I really did enjoy this book, and I would recommend this series to any young adult or historical fiction lover. They might have a different view than I did of the romance between the two main characters. I am very excited for the future books to come. I cannot wait to see what happens with the other children, and I have many questions that will hopefully be wrapped up as I continue this series. I want to start off by saying that I really enjoyed the book, but it was kind of slow at times. I've been reading The Heir for about two months, and I used a maximum of one month when I read the other two books. Honestly, I don't know what made this book so much worse to read, because I can't put a finger on it. It's not a bad book, it might just be that I should not have read it right after I was in a reading slump. I will definitely continue the series when the next book drops! that was CUTE and CUTE! !FUNNY CUTE!! !and the the "I like you, I don't love you" killed ME!! So how should I start this review without being so obvious about how obsessed I became after reading it? It’s been a while now since the author, Elizabetta, sent me a copy of this book, and I’ve only had the time to pick it up recently. I started reading this book on Christmas Eve as soon as I was offered the chance to do so, and read it through during Christmas day. And as much as I love spending time with my family during this time of the year, I couldn’t put this down as soon as I started it. A So how should I start this review without being so obvious about how obsessed I became after reading it? As soon as I heard that a third book in the series was going to happen, I was really excited. The Guardian has become one of my favorite reads, and I was really grateful I had the honor to be one of the few people that the author would trust to make a review of her series. The second book, Category Jeremy, was also just as addicting. Now, I can’t even tell the lot of you how excited I was when another member of the Tremaine family were to get his own story to tell. I was really psyched! And my full on excitedness weren’t for nothing. The Heir was really exciting to read. Just like the first two books, there are adventures and time jumping. It’s so easy to follow the setting of the story, as the author has described both medieval and modern times with so much clarity and vividness. I could clearly picture history just by reading the words in the book. It felt a lot more surreal, as if I’m watching everything happen in front of my eyes. I am so amazed with the story and character development in this book. I liked the female character, Shelby, the most. I liked her boldness to take on an adventure even with her eyes closed. I especially liked her bravery and honesty, her wittiness and sassiness. I’ve rated this book a 5 out of 5. The writing style of the book, with its main characters’ exchange of POV’s, were well written and the story and character development was very impressive. I like how this series keeps getting better and better. I can’t believe I finished this book in less than 24 hours! That was a new set of record for me. How satisfying it is to end the year with another amazing book! A fascinating and fast-paced tale, well-written and unlike any other story I've read. This isn't your typical time-travel romance. The residents of medieval Dover Castle exist and blend into our modern society just as they live in reign in the fourteenth century. Even though this is the third book in the series, this is the first book that I've read in the Chronicles of Dover's Amalgam. I promise you now, however, that it won't be the last. Upon viewing the synopsis, I especially look forward to A fascinating and fast-paced tale, well-written and unlike any other story I've read. This isn't your typical time-travel romance. The residents of medieval Dover Castle exist and blend into our modern society just as they live in reign in the fourteenth century. Even though this is the third book in the series, this is the first book that I've read in the Chronicles of Dover's Amalgam. I promise you now, however, that it won't be the last. Upon viewing the synopsis, I especially look forward to reading the first book, The Guardian. Shelby Hollier doesn't know what she's in for when she steals Soloman Tremaine's wallet. Like the fact that the handsome medical student is actually the medieval heir to Dover Castle. What begins as a scam to formally meet her crush winds up catapulting Shelby through time and into a whirlwind adventure and romance with Soloman. I received a copy of this book through a social media book review page and said I would post an honest review of it. I loved this book. It combines small town life in modern times Louisiana and both time and distance traveling to make this story such a wonder to read. I loved the experiences, the romance between Shelby and Solomon, the lighthearted exchanges between siblings in the royal family, it all makes reading this novel a worthy experience. I look forward to reading future novels from this I received a copy of this book through a social media book review page and said I would post an honest review of it. I loved this book. It combines small town life in modern times Louisiana and both time and distance traveling to make this story such a wonder to read. I loved the experiences, the romance between Shelby and Solomon, the lighthearted exchanges between siblings in the royal family, it all makes reading this novel a worthy experience. I look forward to reading future novels from this author, and discovering new adventures with each one. I have to start by saying this an extremely unique read. In a genre that sometimes doesn't have stories that really stand out, this one sure does. It is a fabulous YA title, and while it is book 3 in a series, you can totally read it as a standalone. I loved the characters, and the dialogue flowed smoothly. I was so appreciative that the author gave me a copy, that I couldn't wait to review it. Shelby the heroine and Dover's castle connection.... a fabulous time travelling novel. Once you catch it is a time travelling novel... Holcomb did a great job with this book. Must read. There are so many things with in this book that make you not want to put it down. Knowing when you first start reading it that it is a time traveller book makes the flash back flash forward much easier to adjust too. First - WOW! This book blew me out of the water. The action, suspense, romance...all that hangs in the balance, will combine to have your heart racing yet aching. Elizabetta has mastered a delicious mix of emotions to play upon the readers heart, combining to make this an unforgettable read you won't want to put down! This book was an intriguing read, different from anything else I've read. Those time traveling through me off a couple times, but over all it was a lot of fun. I throughly enjoyed this read and was drawn to the story and its characters until the last page. I think other readers of this genre will enjoy the story and even ones that are wanting something different. thIS IS SO GOOD LIKE ITS MY ALL TIME FAVORITE!!! A sweet and well crafted fantastic fairy tale. Following the adventures of Shelby and Salomon through time and love will make your heart soar. The dynamics of the Duke of Dover family is something apart. A well created world for adventure and romance. The characters are so well created that in the course of less than half a book you will be falling in love with them and wishing the book never ends. I fell in love with the characters in this story. Most young ladies dream of a knight in shining armor coming to sweep them away. I recommend this book to anyone who enjoys a great fantasy. This book was a little hard to follow at first but I did not realize it was part of a series. Hated to put it down. Great story that had me tearing up at times. Original story line for over-done time travel. Funny and serious that works. 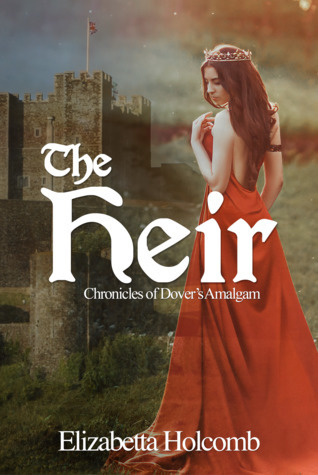 The Heir is the third book in the 'Chronicles of Dover's Amalgam' by Elizabetta Holcomb. Although I believe it can be read as a stand alone story, I think it would be helpful to have read the first two books before this one. I think a better idea of the characters and the Amalgam would be helpful with following this book more easily from the very start. This is the story of Solomon Tremaine, a man from the 1300s, the Marquis of Hastings. He is the heir to the Dukedom which amongst all the usual t The Heir is the third book in the 'Chronicles of Dover's Amalgam' by Elizabetta Holcomb. Although I believe it can be read as a stand alone story, I think it would be helpful to have read the first two books before this one. I think a better idea of the characters and the Amalgam would be helpful with following this book more easily from the very start. This is the story of Solomon Tremaine, a man from the 1300s, the Marquis of Hastings. He is the heir to the Dukedom which amongst all the usual things that comes with the title, also comes with him taking charge of the Amalgam which contains guardians, hosts, and warriors who can time travel. Shelby Hollier lives in Louisiana in modern times. She raises and shows pigs to raise money in order to afford her college tuition. She wants to work in the medical profession. She has a huge crush on a boy in her college, that boy being Solomon. She attends an event that he will be at, and practices something to say to him which she hopes will show him her intelligence, and get him to notice her. He notices her alright, especially as he ends up spilling a blue snow cone all over her when she startles him when she tries to get his attention. Not perhaps a good start to their 'relationship' but Shelby is entranced and in the spur of the moment she picks his pocket, takes his wallet, giving herself an excuse to see him again by returning it, pretending she found it. When she returns the wallet she ends up trespassing on the Tremaine property and to her shock and excitement watches as Solomon and his brothers produce a ring of light which one by one they disappear into. Shelby has no idea what it is or how it works, but she has no hesitation in jumping in behind them just before the ring closes. The ring turns out to be a wormhole through time, and after following Solomon through it, Shelby gets caught up in all the intrigue that is Solomon, his family, and the Amalgam. One of the brothers has the ability to wipe Shelby's memory, but she manages to convince him and the family that it isn't necessary. She even offers her services to Solomon where she will read to him all the books he needs to study in order to pass his modern day medical exams. He is dyslexic and although he can perform surgery perfectly, and has done for years, he needs the official qualifications for when he is in modern times. His family have been reading to him, but he always feels like a burden to them, so he is happy to take Shelby up on her offer. What starts off as a student, helper type bond, escalates, more so for Shelby than Solomon because she already had a crush on him. He will admit that he does feel attraction towards her, but he doesn't believe in falling in love. He thinks it's something that develops over time and is learned. Will Shelby accept that he doesn't love her, but does 'like' her? Will he be able to keep her safe along with his family when he is under constant threat from the enemies of the Amalgam who wants him dead? There is such a lot going on in this book, and although the possible romance is thread throughout it, it's a dramatic story too of how the Amalgam works, what they do, and the danger they are in. I loved the time travel aspect of the story, and how modern day conveniences were in the Medieval world, hidden from the layman of course. There were comical scenes before historic events/balls etc where the Tremaine family let loose with modern dancing and messing around in private before having to be all that is proper when at the event. There were lovely light hearted moments in the book, horrific moments, dramatic moments and romantic ones too. For me the only negative I can report is that one minute Solomon who is 18, and his brother Peter, who is 16 come across as young boys. Other times they come across as very mature men, especially Solomon who is the romantic hero of the book. I don't know if the confusion is caused by the fact that they time travel, but I found it disconcerting. For the most part I felt the Tremaines were all grown up, and I was reading an adult story, but at other times it was like reading a book for teenagers. Despite the confusion in genres though, I did enjoy the story a lot, and am determined to read the other books in the series. I loved, loved, loved this book! Ms. Holcomb puts a new twist on time travel stories. I loved living in the universe that is this book. Its book 3 of the Chronicles of Dover's Almagam but I read it as a stand alone. Shelby Hollier is a high school student that shows pigs at 4H com I loved, loved, loved this book! Ms. Holcomb puts a new twist on time travel stories. I loved living in the universe that is this book. Its book 3 of the Chronicles of Dover's Almagam but I read it as a stand alone. Shelby Hollier is a high school student that shows pigs at 4H competitions. She first sees Solomon at a Beta Convention the previous year. She then comes up with a plan so she can meet him at a concert his family is performing. Said plan kinda backfires and lands her in a heap of trouble. Solomon and Shelby start out kinda rough and I was very interested to see how their story would evolve. And evolve it did at a nice pace. It takes you from the Cliffs of Dover to the mall in New Orleans. From the 14th century to present day. I recommend this book to anyone that loves time travel. It will end up at the top of your favorites. “You took me to London. I’ve watched Paddington Bear over and over. Can we have marmalade? Like Paddington? On a scone? With tea?" This wasn't a bad book. It was not what I expected. There is time travel but the time base was the the middle ages and not present time. The family we follow can travel through worm wholes into anytime periods. They are the guardians that try and preserve the timeline as it should happen. I found it strange when I read that there was an air con in the middle ages! But it is understandable. If you can travel through time you can bring back technology and equipment to help you, like, medicine whic This wasn't a bad book. It was not what I expected. There is time travel but the time base was the the middle ages and not present time. The family we follow can travel through worm wholes into anytime periods. They are the guardians that try and preserve the timeline as it should happen. I found it strange when I read that there was an air con in the middle ages! But it is understandable. If you can travel through time you can bring back technology and equipment to help you, like, medicine which they did not have. I gave it three stars because I felt it was slow in a lot of places and long. I did put the book down a few times. It took me a while to finish it. I would still recommend this book because it is different to other time travel books that I have read. I felt the author new what she was talking about when they traveled to different time periods. What a story. I loved his book and I had a hard time putting it down. It was that good. I think I might have to do a re-read soon. I enjoyed this book. It did take a bit to read, some of it was a little confusing. Very enjoyable . People should read this. Very interesting story. Elizabetta lives in South Louisiana with her children, and cats. When she is not in her writing room creating more stories that surround Dover Castle, she is working nights as a nurse. Mother to 5. Marmee to 1. Her favorite things in life are writing, reading, theatre, traveling, and spending time with her family. She believes the best thing about becoming a published author is hearing from readers Elizabetta lives in South Louisiana with her children, and cats. When she is not in her writing room creating more stories that surround Dover Castle, she is working nights as a nurse. Mother to 5. Marmee to 1. She believes the best thing about becoming a published author is hearing from readers who love her stories that all start with a medieval duke and a modern girl.